It was a sweet night for Anthony Stokes, who should have scored a hat-trick for Hibs. But he was content with the two goals that proved just enough to overcome an Inverness side that eventually presented the considerable challenge expected. Stokes’ return to goalscoring form came at the expense of Caley boss John Hughes, who tried to sign the striker on loan from Celtic in January. While Stokes had every right to feel satisfied it was a mixed night for Mark Oxley, whose second booking of the competition for time wasting means the goalkeeper is suspended for the semi-final. But Oxley will have grounds for some complaint since he lost a contact lens in the clash after which he was cautioned. He was eventually replaced by Otso Virtanen. The Finnish keeper managed to see-out the seven minutes of added time – though not without some nervy moments. The late drama threatened to eclipse Stokes’ earlier contribution. It provided what some might contend was overdue evidence of his worth to Hibs’ cause. Caley’s hopes went up in a puff after the Irish striker emerged from the icy haar that drifted in from the Moray Firth to clinch victory for the visitors. The fog of their post League Cup final hangover has now cleared for Hibs. While their priority might be the league the Easter Road side have more than a century’s worth of unfinished business in the Scottish Cup. This was a victory to cherish given recent events. It was unquestionably hard-earned after Inverness’ strong second-half showing. The holders pulled a goal back through Iain Vigurs with 13 minutes left and spurned several other opportunities to equalise. But how the Hibs fans celebrated at the end. While they might still feel some tenderness after Sunday’s League Cup final defeat by Ross County at the national stadium, Hibs can now redeem themselves there next month against Dundee United, whose manager Mixu Paatelainen was an interested spectator here. The shift from deadlock to Hibs enjoying the comfort of a two-goal lead was sudden. But, following Inverness’ bright start, the visitors had begun to impose themselves on the proceedings. Stokes showed a glimpse of his undoubted class when setting himself to strike on goal after Lewis Stevenson’s cross. He moved back a step before unleashing a right foot shot into the corner of Owain Fon Williams’ goal after 36 minutes. His second, four minutes later, was equally instinctive as he slid in to convert after Jason Cummings’ shot was saved by Fon Williams and following good work down the right by Liam Henderson. But Inverness should have retrieved the deficit in a second half in which they scored once and might have had three goals. Their sole goal, with 13 minutes left, roused the Caley Stadium. 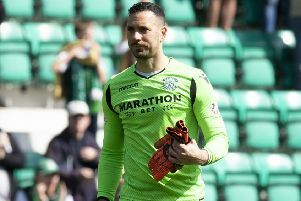 Iain Vigurs drove in after he was left unmarked at the far post after Hibernian failed to clear two successive crosses. Carl Tremarco had missed from a similar area early shortly after half-time, while only Liam Hughes will know how he managed to stub a shot over the bar from the edge of the six-yard box after Richie Foran’s cross. Inverness CT: O Fon Williams, D Devine, G Warren, J Meekings, C Tremarco (L Polworth, 73), L Horner (D Williams, 62), N Wedderburn (M Storey, 62), I Vigurs, R Draper, R Foran, L Hughes. Subs not used: R Esson, J Roberts, R Williams. Hibernian: M Oxley (O Virtanen, 88), L Stevenson, D Gray, D McGregor, L Fontaine, J Keatings (N Gunnarsson, 80), M Bartley, L Henderson, J McGinn, A Stokes, J Cummings. Subs not used: M Boyle, D Handling, K Thomson, F El Alagui, C Dagnall.